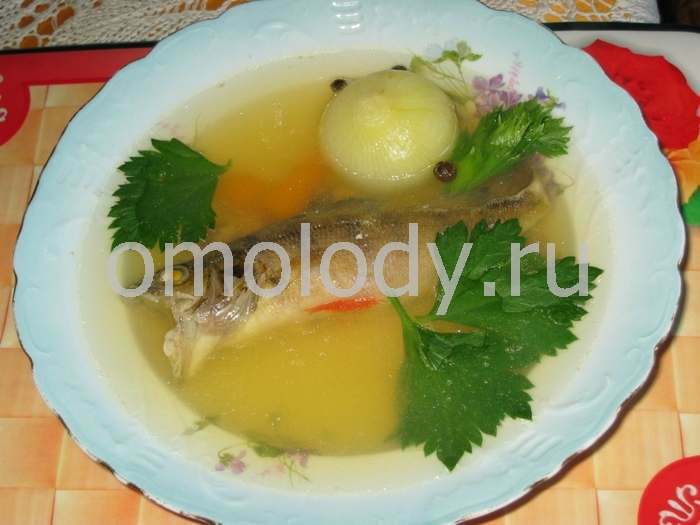 Uha fish broth with dill. Recipes from Russia. peppercorns, salt and bay leaves to taste. 1. Take 600 grammas (1 lb, 4 oz) of perch, ruff or other small freshwater fish, clean it, but don't remove the scales, and wash it. Put it in a pot with cold water and bring slowly to the boil. Skim off the froth, add 20 grammas (1 oz) of parsley roots, 40 grammas (2 oz) of onion and 20 grammas (1 oz) of celery, and simmer for 40-50 minutes. 2. Strain the broth. Add 8 peeled medium-sized potatoes, 2-3 onions and 4 pieces of a large fish, such as zander, turbot, pike, perch or sterlet, and simmer for another 20-30 minutes, skim-ming off the froth as it forms, but leaving the tiny globules of fat. 3. Ten to fifteen minutes before the soup is cooked season with whole peppercorns, salt and bay leaves. Before serving, put a piece of cooked fish and finely chopped parsley and dill in each plate. Fish soup is traditionally served with rasstegai. These are little open pies with a filling; their name comes from the Russian word rasstyognuty meaning "unfastened".